Following the success of the conference in Mykonos, THALES + FRIENDS, with help from the J. F. Costopoulos Foundation, hosted the second Mathematics and Narrative conference, which took place in Delphi from July 20 to 23, 2007. Participants in the conference included some of the world’s foremost mathematicians, historians, philosophers, writers, and narratologists, many of whom had attended the first conference, on Mykonos in 2005, and who all had a special interest in the curious relationship between mathematics and narrative. 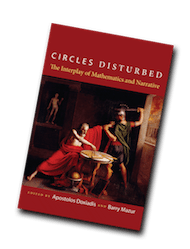 The papers presented in this conference became the basis for the book Circles Disturbed: The Interplay Between Mathematics and Narrative, published in March 2012 by Princeton University Press. For more information on the book, please see Circles Disturbed and the interviews between contributors.